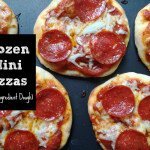 These frozen mini pizzas use greek yogurt and self rising flour for a quick, easy and homemade meal your kids will love. You can freeze just the pizza shells or make the pizzas and then freeze. Add the yogurt and 1 1/2 cups of flour in the mixing bowl of your mixer. Knead for 8-10 minutes in your mixer or by hand. Use the dough hook if using the mixer. Dough should be tacky not sticky. If too sticky use a little of the extra flour and knead in. Roll out each piece into a small circle as thin or as thick as you like. Place on a parchment lined cookie sheet and brush with olive oil. Let cool and then add your sauce, cheese and toppings. Put the whole cookie sheet in the freezer and freeze for 2 hours. When frozen, stack the pizzas and place in ziplock bags and refreeze until you are ready to use. Whenever you want to eat the pizzas, bake in a 350 degree oven from frozen for 10 -12 minutes and then broil until the cheese is browned.